Comprehensive review of Kriama Retinol Cream. See how this retinol cream compares against other wrinkle creams! Kriama Retinol Cream really did not work for my skin to help with anti-aging. This cream has a very thick consistency that is hard to apply to the skin because of how thick it is. The product never fully dries down, and leaves your skin feeling kind of suffocated because of the overwhelming consistency of the cream. The first morning after I applied this product, my skin looked horrible; it was super congested and had a ton of clogged pores. After a while of using this product, I realized it just wasn’t for me; it kept causing skin issues for me and it didn’t help my fine lines or winkles at all. And, for such a thick cream, I didn’t find the product to be moisturizing to the skin, which was super surprising. Overall, Kriama Retinol Cream didn’t work for my skin; it caused breakouts and clogged pores, and I didn’t see a difference in the way of anti-aging at all. The texture of Kriama Retinol Cream is super thick and creamy when it’s first applied. The product feels almost too thick, like a foot cream, except it’s going on your face. The application of Kriama Retinol Cream is kind of annoying; the application of the bottle doesn’t work great and you have to pump the bottle so many times for any product to even come out. The cream is so thick that it doesn’t even properly absorb into the skin. It feels like it’s sitting on top of the skin and not actually penetrating the skin at all. It takes so long for the product to be worked into the skin, and even after it is, it still feels like it’s just sitting on top of it. After about two minutes, Kriama Retinol Cream is a little bit more dry feeling but the product never totally dries down. It feels really gross on your face because of the sticky feeling the product leaves, and it also makes it hard to sleep when your face is sticking to the pillow because of all the product. Something I like about Kriama Retinol Cream is that there is literally zero smell to this product. I really don’t like where there is added perfume into these types of products so I enjoy that this one is scent free. I immediately noticed the next day that this product majorly clogged my pores. Since this product is SO thick, it left no room for the skin to breath, which left my skin looking horrible. The longer term results I noticed from Kriama Retinol Cream is more congestion and clogged pores on my skin. There was virtually no improvement to my wrinkles and fine lines and I didn’t even find this ultra-thick cream to be that moisturizing to my skin. I saw more negative long term affects with this product than positive ones. Kriama Retinol Cream does contain some good ingredients that are supposed to be good for helping with anti-aging of the skin. Hydrolized collagen is a form of collagen that is similar to gelatin. It is supposed to be really great for plumping the skin and really filling in fine lines and wrinkles. Hylaronic acid, an ingredient we’ve talked about before, is one of the main power house ingredients that is meant to seriously help fight off signs of aging. It’s also supposed to help keep the skin moisturized and feeling smooth and plump. There is also shea butter, which is supposed to greatly help lock in moisture and keep your skin feeling firm and plump. These are some great ingredients which can really help with the appearance of aging. 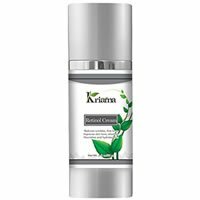 The cost of Kriama Retinol Cream is $18.95 for 2 oz which comes to $9.47 per oz. That is a very inexpensive retinol product. Unfortunately, I couldn’t find any money back guarantee for Kriama Retinol Cream. To buy Kriama Retinol Cream, click here.